We have no house pets at all. But you guys are too good at guessing. I was all set for the Ghost of Christmas Past, or an angel, as Sharon suggested! One of our harum-scarum sons was apparently in too much of a hurry to meet the school bus, and left the laundry room door flapping open for the wind and the snow and—the cat. The ONE time that I’m the first to answer the riddle correctly, and there’s no prize! 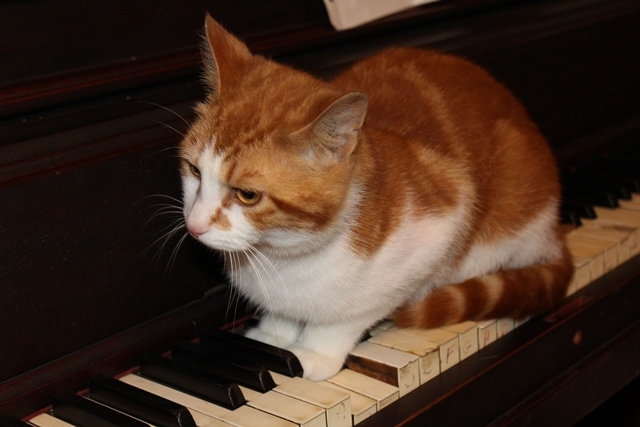 Did you change the cat’s name to Mozart? I know. You deserve better. But na, we liked food names for this batch of kitties: Cream Puff, Muffin, and Oreo. 🙂 We’ll do the classical composers on the next batch. I am so confused…..school. snow……I thought this was June. In some parts of the world we have winter ALL. YEAR. LONG.